1945--President Roosevelt dies while writing his speech to the UN Conference in San Francisco. The conference takes all hotel space, forcing visiting players to sleep at the ballpark. Seals' attendance that year eclipses that of many major league clubs. 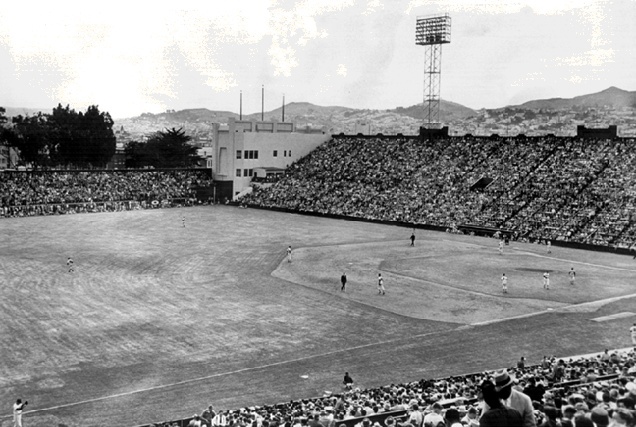 1946--Seals Stadium undergoes needed improvements, and a variety of amenities, making it once again one of the finest parks in the nation. The ugly advertisements on the outfield walls are replaced with solid green. Seals' new owner Paul Fagan attempt to put the Pacific Coast League on a par with the major leagues, paying his players at least the major league minimum. Seals win the pennant with a record of 115-68. Manager Lefty O'Doul is triumphant over rival Oakland Oaks manager Casey Stengel. 1946--Formation of the San Francisco Sea Lions, the city's first professional black baseball team. The league in which they played folded after four months. 1947--The Pacific Coast League makes a bid to be granted major league status, but is turned down despite favorable response from Commissioner Happy Chandler. As a concession the PCL is given a status above Triple A league, but somewhat short of the Major Leagues. Seals' first baseman Ferris Fain is drafted by the Philadelphia Athletics. 1948--The Seals lose the pennant to Casey Stengel's Oakland Oaks, featuring a brash, young, Berkeley kid by the name of Billy Martin. (One particular note: one inning during a Seals/Oaks game was protested and later replayed as Oaks pitcher Buxton was found to have too much pine tar on his glove). 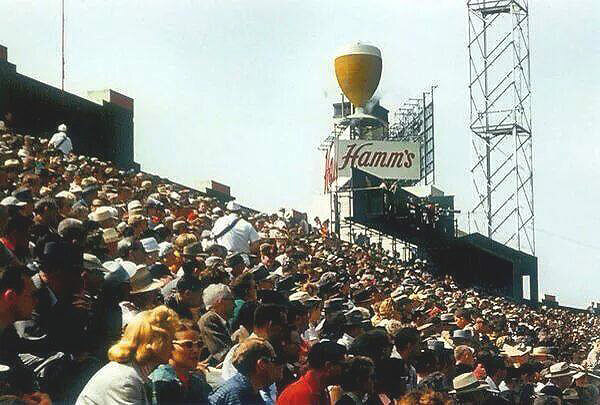 Seals Stadium, with the famous Hamms beer glass signage on Bryant above the brewery, 1950s. 1952--The Major Leagues rescind the rule that prevents them from broadcasting games in minor league cities. Dropping attendance in 1953 squelches any hopes of the Pacific Coast League becoming a Major League. 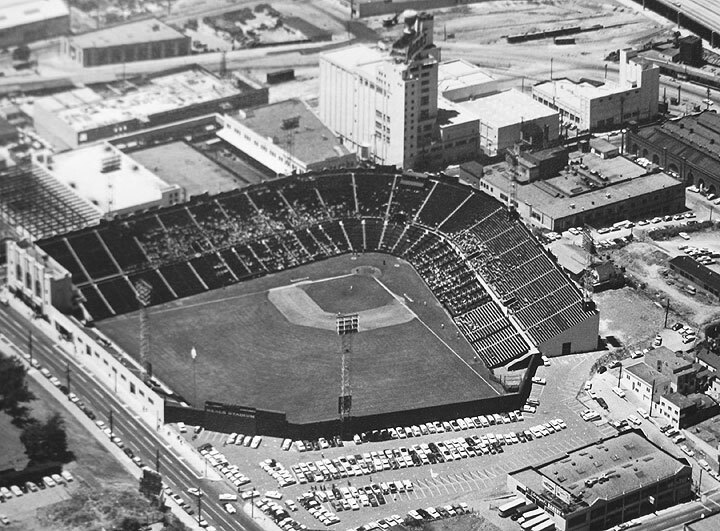 1953-57 represents the lowest point in San Francisco baseball, with few fans attending games. Very little attendance at this game in the Seals' last season at Bryant and 16th Streets. 1956--The Seals become minor league franchise of Boston Red Sox. 1957--In a final flash of glory the San Francisco Seals win the Pacific Coast League pennant.